Don’t use slang in your YA novel. I abide by this rule, yet it’s come to my attention that I may be using slang accidentally! WTF? Let’s back up for a second and state why putting slang in your YA novel is not a smart move. First of all, it’s highly likely that you the author are not a teenager, so your slang will either not be current or be current but used incorrectly. For example, if you tell your kids you’re going to “watch Netflix and chill” tonight and they give you a disgusted look, that’s a hint that you don’t actually know what that expression means to young adults. However, if you’re confident your slang is up-to-date and used accurately, beware of this second reason: all slang dates your book. By the time you publish, teen terminology will have changed drastically. Hell, current slang will probably be obsolete before you finish your 1st draft! So unless you’re writing a period piece or historical YA, or making up your own teen terminology (like in THE MAZE RUNNER), save yourself the trouble and just don’t use slang. #writetip – Don’t use slang in #YA novels. It will be outdated before you finish your 1st draft. Confession: I still use all those words. Okay, not “bummer” but I never liked that one. And “downer” and “bonus” I can see are kind of slang-y. But the others? Are you kidding me?! The rest have been around for decades! Especially “cool”. And now… teenagers don’t say cool anymore?! This article doesn’t reflect the millennials I know. They told me they still say “cool” and “awesome”. Teacher friends also confirmed they hear their students say these words all the time. Even “totally” and “sweet” and “right” get some love. Now if I was a good reporter I’d have gotten some sound bites and testimonials from verified millennials to back up my research, but I started coaching gymnastics this weekend and I was way too busy managing chaos to be organized enough to get proof! So you’ll just have to take my word for it. Or ask the millennials in your life. The conclusion from a writer’s perspective? Even though some slang endures for decades, keep it to a minimum in your writing. A general rule is not to overuse any word, let alone colloquialisms. But… some may worry if their teenage characters don’t use slang words, they won’t sound like teenagers and teenagers will hate the book! To that I say – hogwash! And read YA. You can convey a teenage voice without slang. Plus, though teenagers (and adults for that matter) tend to repeat certain words a lot (eg. : “like” and “you know” and their favourite positive exclamation – mine admittedly is “awesome”), they rarely know they’re doing it and often find reading a character who speaks in such a way annoying. Whew! I don’t know about you guys, but I feel a lot better about slipping the occasional “Cool!” into my manuscript. What about you? Do you worry about slang or the lack thereof in your writing? Totally radical article! I’m working on a book that stars the 9-14 year old crowd, except it’s NOT contemporary. It takes place in the summer of 1980. I’d forgotten about ‘bummer’ so we’ll be adding that to their lexicon asap. I already have them bogarting Pringles, calling each other douche bags, and watching Land of the Lost while eating Norman cereal. Heehee. Either way, this made me laugh. My daughter (who is 24) says bummer, awesome, sweet, cool, and right on a daily basis. I’ve never heard her say ‘totally rad’ though or call anything ‘bogus’. And, what does ‘bonus’ mean? That’s a new one to me. Glad to help refresh your 80s slang! 🙂 I’m tempted to set my current contemporary YA in the ’90s to take advantage of my out-dated teen vocabulary. Though it’s encouraging that your daughter uses many of the classics! I hope “awesome” and “cool” never go out of style. I’m not a teenager, but I am a millennial and I use pretty much all of those words in daily speech, as do my friends. The generation below me might not though. Be sure to ask a lot of people! This is very timely because I’m working on a YA and because dialogue is one of my strengths I’ve been thinking a lot about how high schoolers talk. What’s interesting to me is that as soon as I read this I realized how little slang I’m using, and how little slang I read in YA. Now, I’m cheating somewhat because my characters go to an elite private schools so I’m orienting them to be more articulate/techy and less chatty/hip. Glad you found the article timely, Kate! 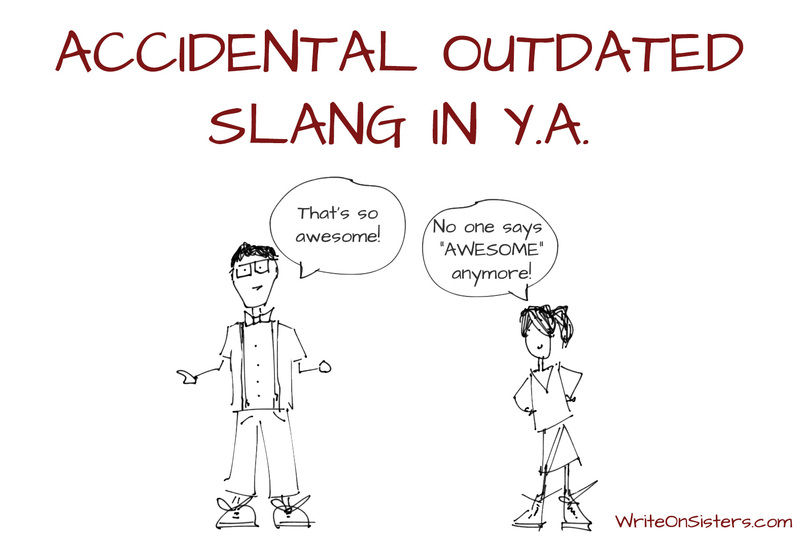 And yes, most YA writers stay away from slang for the reasons I mentioned, so you won’t find much of it in YA novels unless the story takes place in a certain era or location where a specific vernacular is important. Good luck with your novel! Sometimes I love the things I don’t notice when I read more than the ones I file away for future writing. I am writing a piece where characters are living in an alternate reality that takes place in Seattle. The catch is that, although the civilization is advanced, the style and culture remains trapped in a Noir style. So would it be more realistic to use slang from that era or should I just steer clear of it altogether? I did see that you mentioned creating your own slang, but sometime I feel I would be way too cheesy in doing that. If a story takes place in a certain era, using the slang of that era is entirely appropriate. The problem arises when a novel is trying to be current. So I say go for it! I had this exact conversation a while back, and I asked a CP to spy on her teen daughters so I could use their slang words – and avoid my outdated ones. The list she gave was very similar, and I was surprised to see “cool” was in there. Made me feel young. You really should stop worrying about that guy. Slang varies by region anyway. I moved from one region to another as a kid and couldn’t understand ANYTHING for a long time. When I was a teenager my brother (5 years younger) said kids his age don’t use “dude.” I have friends in their teens/20s who use “dude” all the time. There’s a lot of variation by subculture and even just from one school in a district to another. Right? Awesome post. I totally use these words and they’re slang? Bummer. (Just seeing how many I could fit in before coffee.) Completely agree. I always thought about this and, honestly, it’s kept me from finishing any YA novel because…dialogue. Not sounding authentic is huge but, yes, the slang would date the novel. It took me forever to get used to the language in Maze Runner but now I think he’s brilliant for doing that. Hahaha! Thanks for the laugh, Sarah. And yes, MAZE RUNNER will never seem dated unless teens start using – and then discarding – those slang words he made up. But that hasn’t happened yet. I write fiction aimed at women aged 30+. Just a few days ago I was having an online chat with a much younger than me author friend who writes YA and romantic fiction geared at 20 somethings. She’s just turned 30 herself. I expressed that I had trouble with certain scenes and why and she told me I should just draw on my previous experience like she did when writing them. That’s where our age differences and background became very apparent. Then she asked me if there were younger people in my life who I could ‘borrow from’. Well, of course there are. Here’s the thing, Millenials – in my experience – don’t talk unless you’re speaking directly to them. They’re world is in their phones and they communicate, not via voice even over their phones but via text and SnapChat and Instagram and on and on. How could we possibly pick up on current slang when nothing is being spoken aloud anyway? I adore this post! I think you’ve hit the nail on the head with it. I am 56 and wrote a 13 year old boy in my last but one novel – it took my husband to point out to me that, mostly, young male teenagers don’t actually TALK in all this stuff but just use it in internet chatting, too, and just to make him talk normally most of the time – I wrote a 19 year old girl in my last novel and just put words like ‘totally’ and ‘awesome’ where we (as grownups) would say something else – yes, they still say awesome where I’m from, too! Thanks, Terry! And yes, your husband makes a great point – a lot of this slang is used online when messaging, but not often spoken aloud.